Again I wouldn't worry about a printed signature and just scan all your documents to your fiancee as I did in the Philippines. Looks like you are up to speed with your requirements there so good luck the rest of they way!! I wouldn't worry about the expiration date because that's the current form to use so here's a checklist to add to support your affidavit of support. A signed statement from an officer of the bank or other financial institution that states when you opened an account, the total amount deposited for the past year, and the present balance of such account A signed statement from your employer on business letterhead that states the date and nature of your employment, salary paid, and whether the position is temporary or permanent A copy of your last income federal tax return filed, or a report of commercial rating concern (if self-employed) Hope this will help to get you started. Hey there Nayrey, Congrats to you and so not to worry because even my fiancee in the Philippines had her interview and was not asked to see the I-134 affidavit either so that will come later when we file the I-186 affidavit of support when we do the adjustemnt of status. So for now just relax and wait for your visa and then after wards you can book your flight to the US. No need for an email as long as u have a NVC number so have your fiancee take care of the visa fee of $265.00 at BPI bank as soon as possible and then start on your DS160 visa application so as long as u have your NBC number u can get a lot done. Keep checking the CEAC website each day and it should be ready to ISSUE your visa. Once you receive it make sure all the information is correct, the name and birthdates and then you can book your flight. As far as I know there shouldn't be any more fees from U.S. immigration until it's time to do your adjustment of status after you get married. Good luck my friend!! Go ahead and start by having your fiancee pay for the visa at PBI Bank. http://www.ustraveldocs.com/ph/ph-niv-paymentinfo.asp Here's a complete list of whet to do there in Manila before scheduling the interview http://www.visaconnection-philippines.com/k-1-visa-application.html Don't wait get the ball rolling and good luck on your journey. If you do everything correctly your jiancee could be here within 2 months! 2 weeks is the norm and then get your case number as well and pay for the visa as soon as possible. Great question as I booked a flight for my fiancee AFTER she received the visa IN HAND. So NEVER EVER book a flight until the visa has arrived and the information is correct. Reason being NOT to book a flight is... 1. your Visa may be delayed or worse rejected from the embassy and 2. There may be an error in the spelling of the names or dates on the visa once received so in some cases you'll have to send it back to the embassy from where it was issued to correct the info on the visa . You never want to book a flight if there is an error on the visa because it could take up to a month to send it to the embassy and for them to fix the error on your visa. Better to safe than sorry. Or worse yet you book a flight and the immigration will not allow you to board because the visa and ID do not match. You can however get a flight itinerary for the proposed travel dates in advance and then book the flight once your visa is good to go Hope that explains to never book a flight till you have it and the info is correct. Well looks like most of the November posts are done and as our good friend Don Meredith on Monday night Football used to sing, shut out the lights the party is over. So turning off the💡💡 for our November filers!! Hope everyone is enjoying their time with their fiancees/wives&husbands!! On to the next phase the adjustment of status. God bless everyone!! Yes sir including the November thread? Looks like most of our friends are just about done with phase 1 now that our fiancees/wives are here. How is July and August going? Take care Greenbaum and enjoy your day my friend!!! Thanks and roger that!! How's the family? Yeah she rested pretty much all day today so I know she's feeling we rested so we will get that social security card taken care of this Thursday and get our marriage license too so hang in the my friend and talk to you soon. 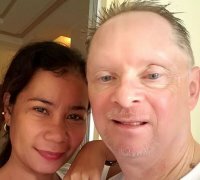 Well everyone my fiancee Maria finally arrived yesterday from the Philippines and it is great having her here safe and sound. Took nearly 2 hours for her to emerge from customs and border so I was sweating it wondering if she even made the flight from Korea to Vegas. Planning on a October wedding so hope everyone is well!!! What Exacty Do i Send to my fiancé? ?